The GFE, Cooper's first tire to focus on lower rolling resistance, utilizes advanced design and materials technology to maximize fuel economy, saving money at the pump while providing excellent traction and treadwear. 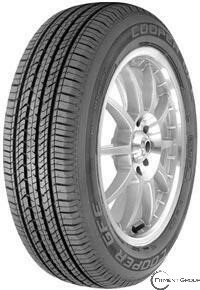 The GFE is a touring tire targeted for fuel-efficient vehicles, but is also offered in popular broadline sizes. Reduces energy used when rolling through the tire footprint which improves gas mileage. New materials technology provides long life while maintaining a superior level of performance in all weather conditions. Nano-materials technology enables an optimal balance of wet traction, dry traction and improved fuel economy. Utilizing ventless technology in the tread area, the GFE exhibits a crisp, clean, premium appearance.